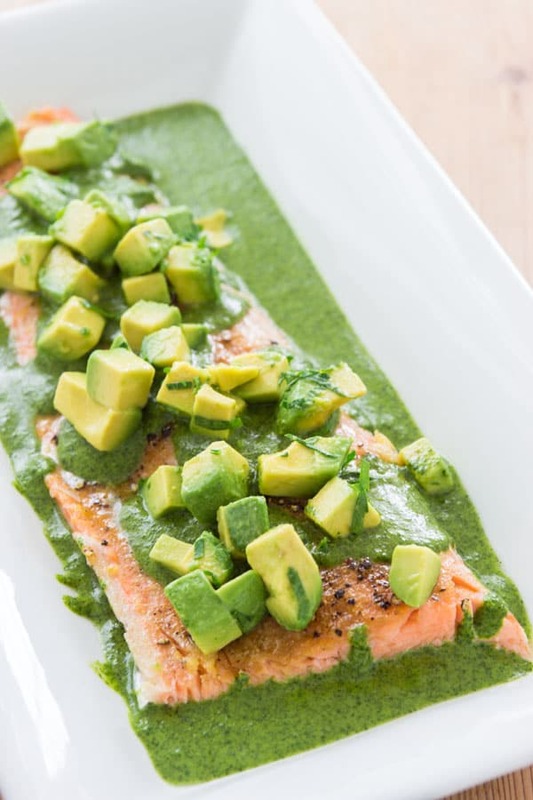 Armed with this easy technique for slow poaching a salmon fillet in the oven, along with a vibrant salsa verde, loaded with cilantro, parsley and avocado, this is a weeknight meal that's dinner-party ready. I love poaching salmon because it keeps the fish both tender and moist. The problem is, that by submerging the salmon in water, you end up losing flavor in the poaching liquid. That’s why vacuum sealing the fillet in a bag and cooking it sous vide is such a great solution. You get melt-in-your-mouth salmon without watering down the flavor. But cooking sous vide has its own set of drawbacks, the most obvious one being that many people don’t have a sous vide setup at home. Also, when you’re dealing with large pieces of fish (like a whole fillet of salmon), it’s tough to find a bag and chamber vacuum large enough to accommodate it. That’s why I developed this method of poaching salmon in a regular oven set to a low temperature. By wrapping the fillet in foil, you’re not constrained to the size of vacuum bags. This allows the salmon to slowly poach in its own juices, making it incredibly tender and moist, without giving up any flavor. Topped with some big cubes of avocado, this is a rich creamy dish that still keeps things light enough to be served on a hot summer day. Serve it hot, or chill the salmon for a delightful brunch entree that can be served with a salad. If you plan to make the sauce ahead of time, blend all the ingredients except the lemon juice together, as the acid will change the color of the sauce. Then, when you’re ready to serve it, just whisk the lemon juice in. Move the oven rack to the middle position and preheat to 250 degrees F (120 C). 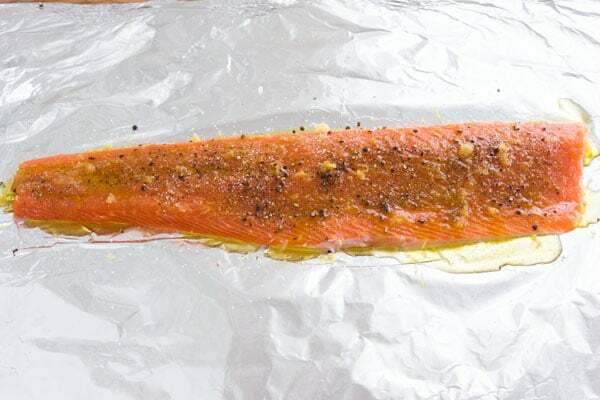 Cut a large piece of foil that's about four times the width of your salmon fillet, and a few inches longer. If your foil is not long enough, you may need to join a few sheet together by lining the edges up and folding them over a few times. Scale and debone your fillet and then use paper towels dry the surface of the fish. Rub 2 tablespoons of olive oil on both sides of the salmon and place the salmon skin-side down on the foil. Rub in the 4 cloves of grated garlic and sprinkle with the lemon zest, coriander powder, 1/2 teaspoon of salt and pepper. Fold the aluminum foil up and over the salmon and seal the top by folding down the top edge 3 or 4 times. 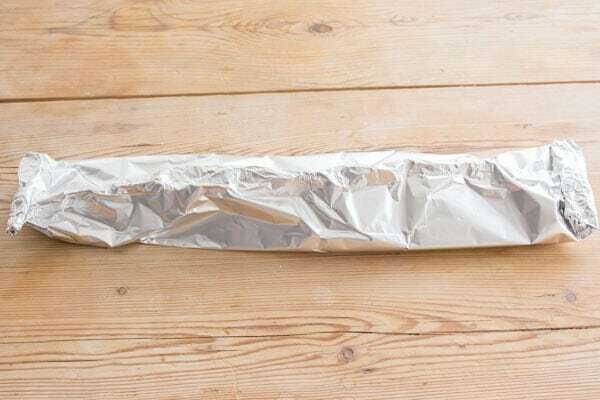 Fold the left and right sides of the foil 3 or 4 times to make a package and place the package on a baking sheet. Bake the salmon for 25-30 min or until thermometer reads 135 F (57 C). To make the sauce, add the cilantro, flat-leaf parsley, 1/4 cup olive oil, 3 tablespoons of lemon juice, 1 clove of garlic, 1/2 teaspoon of salt, and white pepper to a small food processor or blender. Process until smooth. Cut the avocado in half lengthwise, and then remove the pit, and peel. Cut the avocado into 1/2" cubes and then toss with a little lemon juice to keep it from oxidizing. To serve the salmon, you can unwrap it and cut it up into portions or transfer it whole onto a serving platter. 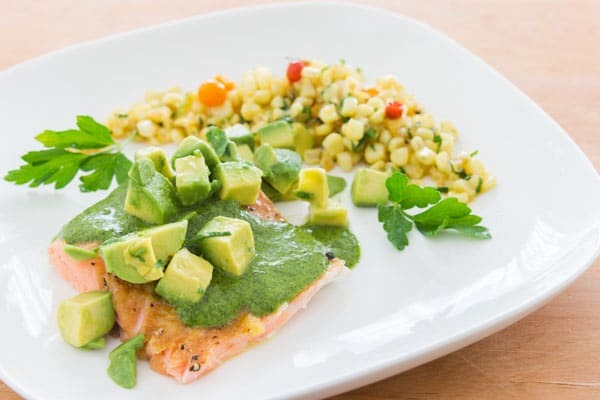 Drizzle some sauce on and around the salmon and scatter the avocado on top. This looks delicious! Would you recommend leaving the salmon at room temperature for a while before baking? Hi Ryoka, you can and it will speed up the cooking time, but it’s not necessary in this case. Quick how much is 30 grams of cilantro? I dislike cilantro ,any suggestions for a different herb combination?Thanks. It’s impossible to quantify accurately through volume measures as leaves are fluffy. Digital kitchen scales can be bought for about $12, it’s a worthwhile investment. All that said, if you’re okay with amount being off, I have medium sized hands and it’s a loose handful. Having not made with with other herb combinations and not knowing what herbs you do like, it’s hard to make a suggestion, but you could do it with all parsley for a more traditional salsa verde. I think I could drink the salsa verde! My next piece of salmon will be bathed in it! I’m curious if this is essentially the same as cooking salmon en papillote or if using foil instead of parchment paper changes the process significantly? since coriander and cilantro are the same, can I just substitute coriander powder for more fresh cilantro? not sure how much to amp things up by though. … why is salmon filed under vegetarian? made this dish with chicken breasts instead since I’m the only fish lover in the family. It was DELISH! Making some more salsa verde right now to drink it! It was delicious. Thank you! It was a bit too much of the sauce for us, and we overcooked the salmon a tad, but still very good.